Welcome to the September 2015 issue of our occasional newsletters. Cyprus, a beautiful island in the eastern Mediterranean, is now mainly known as a popular holiday destination. With its pleasant beaches, beautiful mountains and bright sunshine, it is difficult to imagine that this island was once the heart of the sugar industry that supplied western Europe. Before the medieval period, honey was the source of sweet flavouring. 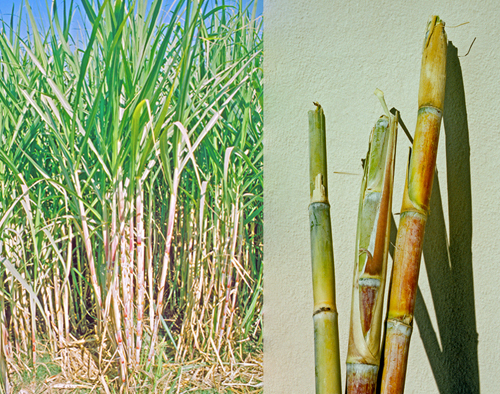 The cultivation of sugar cane probably originated on the islands of the south Pacific, gradually spreading to India and China. It slowly expanded westwards, to Egypt and the eastern Mediterranean, and by the 10th century there is evidence of a sugar industry in Cyprus. When western armies went on crusade to the Holy Land, they encountered sugar cane for the first time. Gradually, sugar became known in Europe, initially as a medicine. Honey continued as a sweetener for most people, because sugar was a very expensive luxury import, but a taste was acquired for this strange new substance. In England in 1226, King Henry III asked the Mayor of Winchester to obtain 3 pounds of Egyptian sugar, ‘if so much is to be had at one time’, at Winchester’s huge fair on St Giles’s Down, which was one of the largest in Europe. Sugar also appears in the 13th-century household accounts of Eleanor de Montfort, Countess of Leicester. When the Crusaders lost control of the eastern Mediterranean at the end of the 13th century, some of them moved to Cyprus and set up sugar-cane plantations and factories. The island became a major exporter of sugar, and in 1494 Pietro Casola, an Italian traveller on his way to Jerusalem, wrote: ‘The abundance of sugar-cane and its magnificence in Cyprus are beyond description. The patrician, Francisco Cornaro of Venice, has at Limassol a great estate, Episcopia, where so much sugar is made that I believe there must be enough for the whole world.’ The port town of Limassol is on the south coast of Cyprus, and the Venetian Cornaro family had extensive sugar plantations a short distance to the west of the town, at Episkopi, while the Knights of St John had plantations around their castle at Kolossi, which was closer to Limassol. 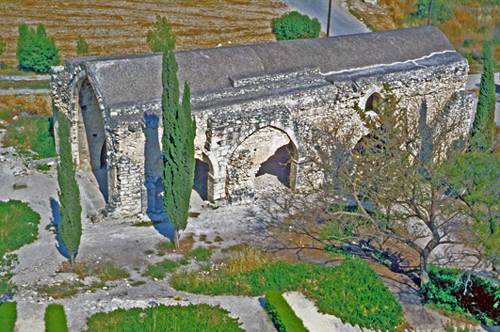 As the medieval sugar industry in Cyprus grew in importance, a factory and watermill were built in the grounds of Kolossi castle. This castle was originally built in the 13th century, though the structures seen by tourists today are of mid-15th century date. After harvesting, the ripe sugar cane was stripped of its leaves and chopped into pieces, which were crushed between two millstones in a watermill powered by a massive aqueduct carrying water from the Kouris river. A thick sweet black liquid was released, which was boiled in the nearby factory to produce a black syrup, and repeated boiling then refined the syrup so that it became increasingly white in colour. The boiled sugar was next poured into conical clay moulds that had a wide mouth and narrow perforated base, and these were set up over clay syrup jars. This allowed any liquid to drain slowly into the jars, leaving solid cones of sugar in the moulds, known as a sugar loaves or sugar cakes – the form in which sugar was sold. The liquid in the jars might be boiled yet again and the process repeated. The jars and moulds were washed clean in basins of water, though many moulds broke, so that thousands of pottery sherds have been found in archaeological excavations of sugar factories. 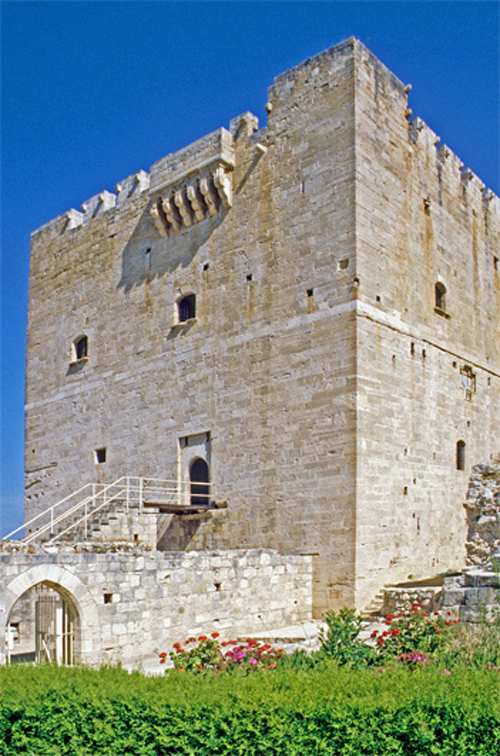 The produce of Cyprus reached all parts of Europe via the Venetian trade networks, making the island the heart of the sugar industry. In 1488, the Knights of St John lost control of the area to the Cornaro family, and the following year the Venetians took control of Cyprus. This lasted until 1571 when the Ottoman Turks seized the island. The sugar industry then began to decline in the face of cheaper sugar from South America and subsequently the Caribbean. 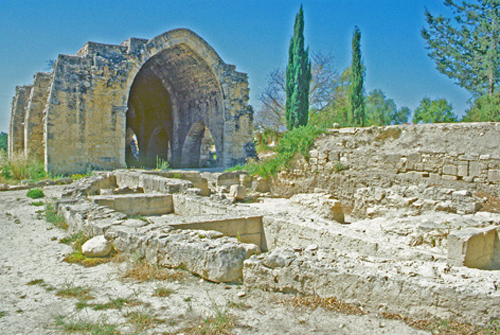 Nowadays, the remains of the early settlements, castles like Kolossi and the ruins of sugar factories are of historical interest, and Cyprus is a honey-pot for tourists. We were pleased to receive many compliments about our last newsletter, far more than normal. The can-openers and gruesome murder of Fanny Adams (‘Sweet FA’) proved popular, but most praise was for Ivy Clarke and the miniature woollen socks that she knitted as war work to raise money. This was a small story that highlighted how, in history, the lives of ordinary people are just as relevant and interesting as celebrity characters. One American reader sent us a picture of a pair of socks that she herself was inspired to knit – and now intends to knit more for her friends. The popularity of historical fiction is riding high – novels as well as television, radio and cinema adaptations. As historians, it is difficult to switch off, because we need to know what is true and what is invention, but some readers treat fiction as a way of getting inside historical periods. This can be hazardous, since the priority of a novelist is to produce a convincing story with an authentic atmosphere, even if it means subverting facts. One of the joys of writing history books is that they are based on evidence, and everything is true, however strange. Having been immersed in Jane Austen for ages, we have spotted numerous spin-off novels, from vampires to prequels and sequels. With two exceptions, we have resisted them – to avoid mixing fact and fiction in our own minds. One exception was Death Comes to Pemberley by the late P.D. James, which is a Pride and Prejudice sequel with a mystery plot – but it was a disappointing novel full of errors. At our talks, everyone agreed and also asked: ‘Is Longbourn accurate?’ This novel by Jo Baker is a version of Pride and Prejudice told from the servants’ quarters. Try as we might, it is impossible to find fault with Longbourn. It is exquisitely written, and Jane Austen would surely have loved it. We are now looking forward to the film. If you have read our book first (Eavesdropping on Jane Austen’s England – Jane Austen’s England in the US), you will appreciate Longbourn so much more. This might sound like the title of a mystery in an old detective novel, but it is actually a real-life (and death) story relating to William Jones, who was born in 1755 at Abergavenny in Wales. In 1781, he became the curate of the parish of Broxbourne, then a small village just north of London. 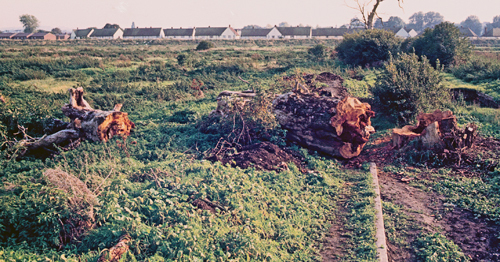 Elm timber was valued for floorboards, furniture and – as here – coffins. Before iron pipes, it was also used for water pipes by boring out the centre of elm branches and trunks, because elm is resistant to rot when permanently wet. Elm trees were an intrinsic part of the British landscape, growing mostly in hedgerows, and they were often depicted in landscape paintings, most notably by Constable. All that has gone. From the 1920s, elms were affected by Dutch elm disease, a fungus that is spread by elm bark beetles, and in the 1970s a more aggressive epidemic led to the loss of over 60 million elms. William Jones died on 12th October 1821 and was buried ten days later, with the simplest of elm coffins and ceremonies – the sort of burial that is least helpful to archaeologists, because no evidence survives apart from the skeleton. London has always been a city through which to travel to other places, as well as a destination in its own right. Nowadays, the airports, railway stations and coach stations are the transport hubs, but when travel relied on horses, coaching inns performed this function. These inns stabled teams of horses so that stagecoaches and mail coaches were provided with fresh animals along their route after travelling around 7–10 miles. They also offered food and drink to travellers. Some visitors used coaching inns as hotels, renting a room for the duration of their stay and taking some meals there. One of the most famous was the Belle Sauvage, also known as the Bell Savage, on Ludgate Hill. 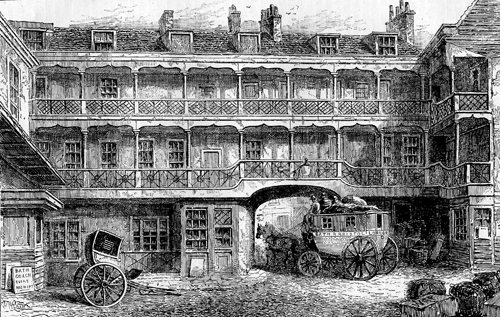 Parson James Woodforde, whose parish was at Weston Longville near Norwich in Norfolk, always stayed at the Belle Sauvage when visiting London, though he did not always enjoy the experience. On 24th June 1786 he arrived with his niece, Nancy, and the next day he wrote in his diary: ‘We breakfasted, supped & slept again at the Bell Savage. Very much pestered & bit by buggs in the night.’ The next night was worse: ‘We breakfasted, supped & slept again at the Bell Savage – I was bit so terribly with buggs again this night, that I got up at 4. o’clock this morning and took a long walk by myself about the City till breakfast time.’ For the final two nights, he found an uncomfortable solution: ‘I did not pull off my cloaths last night but sat up in a great chair all night with my feet on the bed and slept very well & not pestered with buggs.’ Woodforde’s extensive diaries are published by the Parson Woodforde Society, and this one is edited by R. Winstanley and P. Jameson (1999) as The Diary of James Woodforde. Volume 11 1785–1787. Belle Sauvage or Bell Savage? His conjectured derivation gave rise to even more guesswork, with famous women such as Pocahontas being put forward to account for the name. Or maybe the Bell on the Hoop? 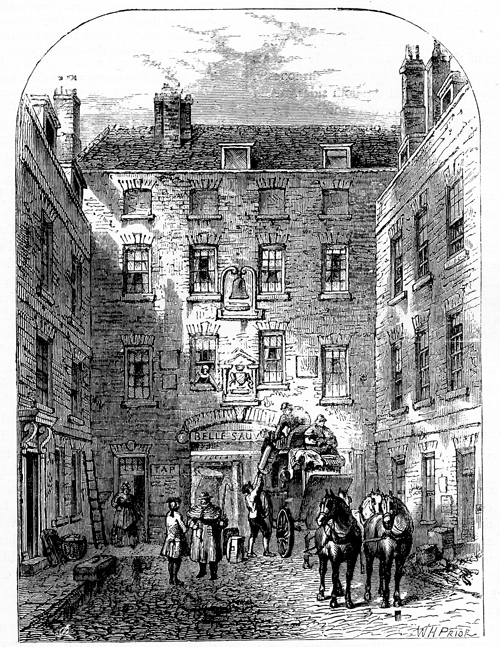 Dating to 1453, the deed was written in Latin and recorded the grant by John French to his widowed mother Joan French giving possession of ‘all that Tenement or Inn, with its appurtenances, called Savage’s Inn, otherwise called the Bell on the Hoop, in the parish of St. Bridget in Fleet Street, London.’ Lysons had discovered that the famous Belle Sauvage was actually the Bell on the Hoop, and in his letter he pointed out that there were other inn names with a hoop, such as George on the Hoop, Hart on the Hoop and Swan on the Hoop – but he never thought to explain the significance of the hoop. The formula ‘on the hoop’ was a feature of many early inn signs, but its precise origin is unknown. It may been a reference to a hoop from a wooden beer barrel, signifying an alcoholic drink, such as in the modern ‘Frog and Firkin’. Or it might simply have been a circular metal hoop in which to suspend the emblem of, say, a bell or a swan, leading to one inn being referred to as the Bell on the Hoop to distinguish it from another inn called The Bell where the sign was fixed on the wall. Alternatively, there may be a totally different meaning. The famous Belle Sauvage inn was demolished in 1873, but the mystery surrounding its name still stands. The latest magazine article we have had published is ‘A Propaganda Lullaby’ in Folklife Quarterly for July 2015 (pp. 46–7), which is about the song known as ‘Naughty Baby’ that terrified young children into sleep with the threat of Napoleon’s invasion of Britain. It actually has much earlier origins, as we explain. Check out the FQ website here. In 1893 Charles Hagberg Wright was appointed Librarian and served until his death in 1940. He developed the unique classification system, dealing first with books on the arts and humanities, and then classifying thousands of others under various topics within a wonderful ‘Science & Miscellaneous’ section. If only this system was copied elsewhere, as it would breathe life into books, instead of, for example, the Dewey Decimal system. 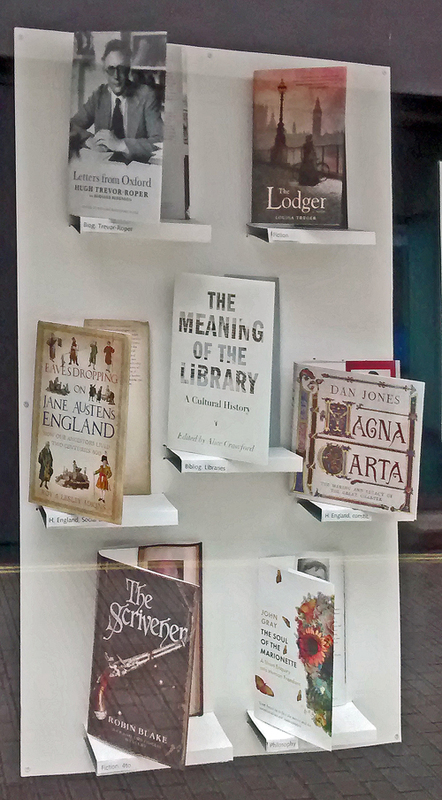 In the London Library, our own book is classified as H. England, Social &c, whereas in our local public library it is 942.073. You can download a complete classification list from the London Library website, and for further information see a blog piece written by Amanda Stebbings of the London Library. We have three or four talks under discussion for ‘Eavesdropping on Jane Austen’s England’. Two that have been agreed for 2016 are in Exeter. One is for the ‘Pinhoe Angels’ at the church hall in Main Road, Pinhoe, on Tuesday 1st March at 7.30pm. The other one is for the U3A on Thursday 27th October at the Mint Methodist Church, Fore Street, Exeter at 10am (the talk starts at 11am). You will need to be part of these organisations to attend, but this gives you plenty of notice to do so! As late as the 1960s, the same chant was still being used in Berkshire and elsewhere. School half-term once coincided with ‘Guy Fawkes Night’ or ‘Bonfire Night’ on 5th November, and children spent their holiday making an effigy of Guy Fawkes, dressed in old clothes, which was paraded round the streets, while passers-by were accosted with ‘Penny for the Guy?’. The money that was collected was spent on fireworks and the ‘guy’ was burned on a bonfire, accompanied by fireworks, but concerns about accidents have killed off the custom. The rituals around Guy Fawkes Night each year on 5th November are among the few traditions that have a known origin, starting as a commemoration of the failure by the Catholic Guy (or Guido) Fawkes to blow up King James I and Parliament in London on 5th November 1605. Guy Fawkes was caught the night before with the gunpowder in the cellars beneath Parliament. Under torture he revealed the names of his Gunpowder Plot accomplices and was sentenced to be hanged, drawn and quartered. Parliament decreed that special thanksgiving church services should be held each year on 5th November, along with bonfires and the ringing of church bells – traditional forms of celebrating. In many places the new custom seems to have been slow to take hold, but was then enthusiastically adopted. Initially, no effigies were burned on the bonfires, and for some years folklorists thought that the tradition of bonfires had actually been transferred from Halloween on 31st October to Bonfire Night. This may have some truth in areas defined as ‘Celtic’, but in England there is very little evidence for Halloween bonfires. Although Bonfire Night is unlikely to have any roots in Halloween, after four centuries it is now being eclipsed by Halloween. Health and safety concerns have meant that families rarely hold their own events on 5th November. Instead, bonfires and firework displays have become closely controlled commercial events, quite often on the nearest weekend, not even on the 5th. 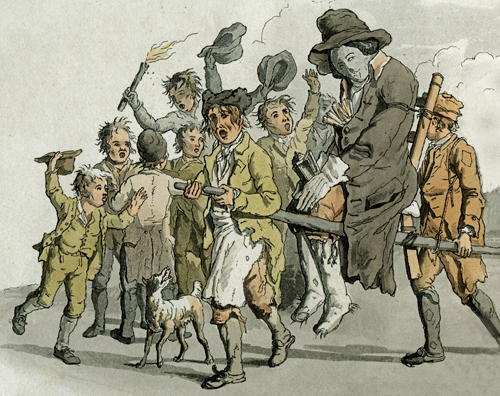 In a few places it still continues in a traditional form, as at Ottery St Mary in Devon where blazing tar barrels are the focus of the celebrations, while Lewes in East Sussex has the biggest bonfire celebrations in Britain, including torchlit processions with effigies of current figures of hatred. Bonfire Night was once the sole day of the year when fireworks were seen in Britain, but firework displays are now commonplace at mass celebrations such as New Year and for personal celebrations such as birthdays. The significance of fireworks has been lost, and instead Halloween has become a bigger event, with traditions imported from America, such as ‘trick or treat’. Supermarkets in Britain get into a frenzy over Halloween, desperate to sell all things ghoulish. And a final note – it was once traditional for the shops to wait until 5th November had passed before filling their shelves with Christmas goods, but this year we have spotted Christmas cards and other gifts on sale at the beginning of September!